Accessory terminal: You can plug in the optional Nikon MC-DC2 remote shutter-release cable, WR-R10 wireless remote control, or GP-1 GPS (Global Positioning System) unit here. Check the camera manual for help with the related settings provided via the Accessory Terminal option on the Setup menu. Microphone jack: If you’re not happy with the audio quality provided by the internal microphone, you can plug in the optional ME-1 stereo microphone here. USB and A/V port: Through this port, you can connect your camera to your computer for picture downloading. The same port enables you to cable the camera to a television for picture playback. 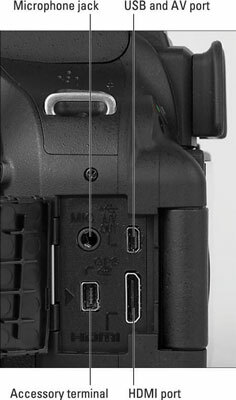 Nikon supplies the cables you need for both connections in the camera box. You use the same port to attach the optional WU-1a Wireless Mobile Adapter, which enables you to transfer pictures to some smart phones and tablets via a wireless network. HDMI port: You can use this port to connect your camera to a high-definition TV, but you need to buy an HDMI cable to do so. Look for a Type C mini-pin cable. If you turn the camera over, you find a tripod socket, which enables you to mount the camera on a tripod that uses a 1/4-inch screw, plus the battery chamber.